The Runner | They Said No: What's next for Surrey transit post-plebiscite? They Said No: What’s next for Surrey transit post-plebiscite? “I was of course disappointed, but not surprised,” Surrey Mayor Linda Hepner told The Runner while reflecting upon that the results of the Metro Vancouver transit plebiscite, which revealed that the people of her city were overwhelmingly against the “Yes” campaign. It was a setback for the new mayor’s plans to deliver on a campaign promise, but not the end. The plebiscite, which asked Metro Vancouver voters whether or not they’d support a 0.5 per cent sales tax to fund transit expansion and improvements across the region, ended with a 62 per cent decision in favor of the “No” side. While not legally binding, the results ensure that if these improvements are to be made, the additional funds will need to be found elsewhere. The mayor’s lack of shock was not unique. At the best of times it’s not easy to convince a majority to willingly pay higher taxes. Despite a significant advertising push by the well-funded “yes” campaign, the “no” side was able to take control of the public narrative early in the campaign and never let go. The “no” side was well supported by local businesses and anti-tax groups. A large amount of attention was heaped on the publicly unpopular TransLink, and they didn’t help their own case with a string of bad PR incidents. Add to that Metro Vancouver’s already high cost of living and it became clear early on that the question wasn’t if the plebiscite would fail, but by how much. Despite the result, Hepner, who was elected last fall on a platform to bring light rail transit to Surrey, remains unfazed and determined to make the project a reality. The result has not changed the mayor’s thinking that the city’s growth over the next few years will require significant improvements to the transit system. She points out that the last significant upgrade to transit infrastructure in Surrey was completed in 1994 and since then the city’s population has more than doubled. The federal and B.C. 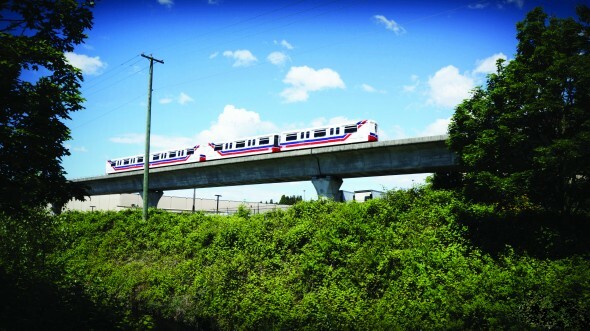 governments have each committed to providing one-third of the funding required for Metro Vancouver transit enhancements. A “yes” vote would have secured the last third needed to fund the project. Even before the plebiscite began Hepner spoke of a “plan B” for securing that last third. Since the result, Hepner and other involved parties have engaged in “exploratory discussions” with three interested outside parties regarding the possibility of securing financing for the project from the public sphere. The mayors’ council is split on the idea of seeking private financing for the regional funding portion of the light rail project. Despite this, Hepner cites the time lost to the months-long plebiscite as reason to continue moving forward on the project while exploring all options. As she acknowledges, time is of the essence. “We have never come this close to having the approvals of both levels of government for this project as we are right now and I can’t let that slip away,” she says.